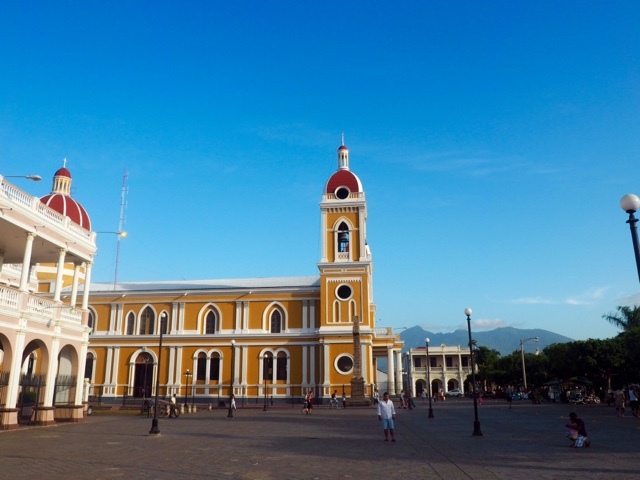 We had two very, very long travel days before reaching Granada, including crossing the border from Honduras to Nicaragua. Eventually we arrived mid-afternoon, so there was still some time to explore the city. There's lots of colourful buildings and pretty architecture to see. We got a brief tour and history lesson from our local guide, taking in a church, the cathedral, and the main square. There was a bit of free time to explore the main street, a pedestrianised area full of bars and restaurants, and street vendors. Then we met up again for dinner and drinks at El Tercer Ojo, which had a menu more similar to what I'd expect at home, rather than what we've had here so far, but was still very good. The next morning we started our full day trip around the local area. 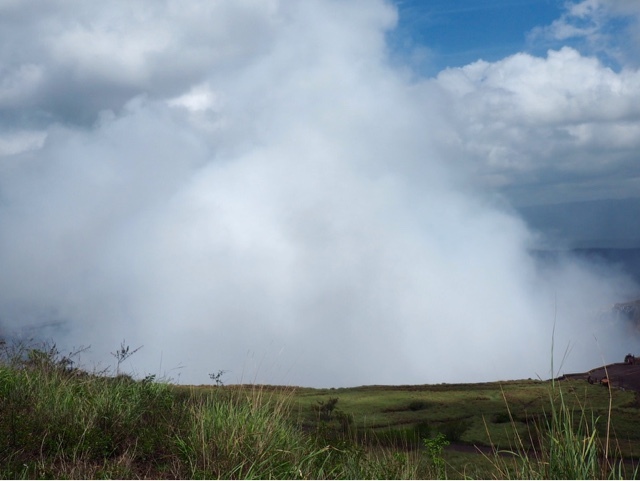 First stop was the Masaya Volcano (Nicaragua is the land of lakes and volcanos!). There's an active and a dormant crater, which both sit inside a huge crater from an ancient super volcano. We drove into the park, and started by exploring the bat cave, kitted out with torches and helmets. The bats are small and fast, so a bit tricky to see, but you can hear plenty, especially after turning off all the torches. Then, we headed back to the craters and hiked along the ridge between the two. The dormant side on the right is now full of foliage, while the active one to the left is quietly spewing huge clouds of gas. 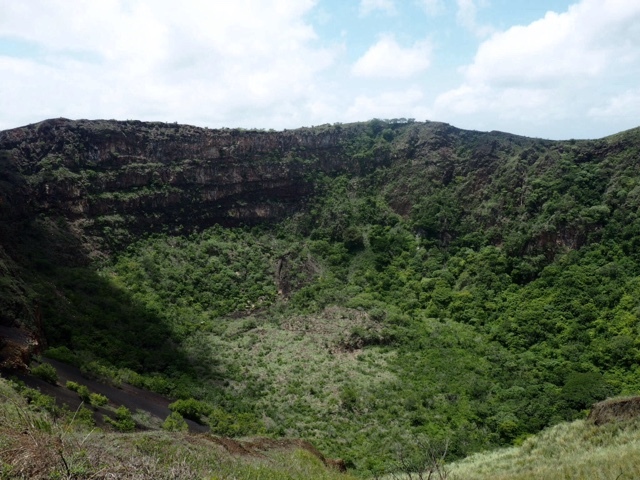 We got to go down to the side of the active crater too, standing very close to the edge. You can't even see how far the drop is, because of the clouds of gas obstructing the view. Our next stop was the Masaya handicraft market. I enjoyed the Guatemalan markets, as I do with most anyway, but it was nice to see a change of goods after the Guatemalan ones started to look the same. Wood was my choice of material this time, picking up another pair of earrings and a small, colourful, wooden block calendar. 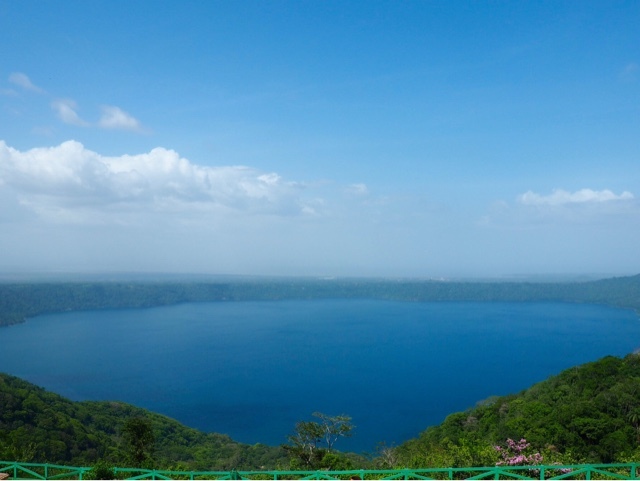 Then we continued to Laguna de Apoyo, stopping for a quick lookout point with an amazing view on the way. We got access to a resort, where we could swim, kayak, or paddle board in the massive, blue lake, or relax on one of the floating wooden docks. I lunched on quesadillas here too, which were very good! Our tour for the day also included cocktails here, and our guide whipped up something similar to rum punch - delicious, but very easy to drink! 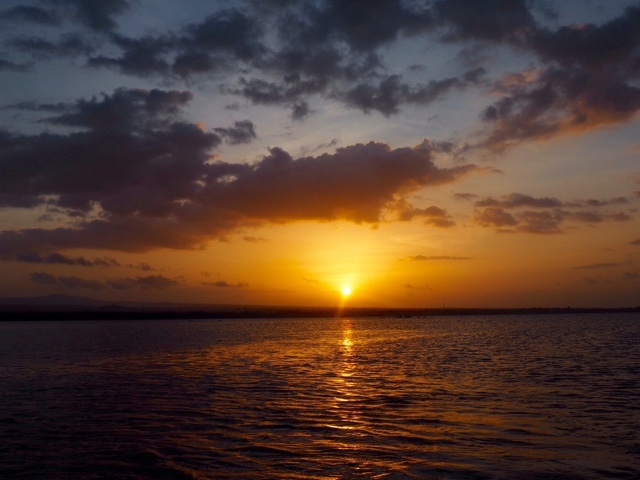 Our final stop on the tour was a boat ride around the Isletas, tiny islands around Granada, which was made especially beautiful by the sunset. The rum punch came with us, so we carried on having a great time! The highlight islands are a historic cemetery and one home to a group of monkeys. You can swim off the boat to get nearer to that one, but watch just how close you go - the monkeys can get aggressive! Once we made it back into the city, we had cake before dinner, as two of the girls have their birthdays around now. We headed out for dinner and drinks at the Garden Café. Fajitas were on the menu for me, accompanied by lots of sangria for us all! Rather than going out for more drinks after that, we ended up back at the hotel (El Club), where we had a late night dip in the courtyard pool, then got the staff to let us watch Game of Thrones on the TV screen in the bar!